We love the gas stations which were built during the 1940's through the 1960's. If you are lucky, you may still have one left in your town. They are like an endangered species now that more and more gas stations are closing. Most of these gas stations have an almost breathtaking Bauhausian influence with their clean simple modernist lines. If this is your cup of tea, you must rent the movie 'Les Parapluies de Cherbourg' which features an utterly brilliant gas station which will make you cry from joy...it is that beautiful. Like stepping into an art work. Then there are they days when Los Angeles looks like a living art installation, or perhaps an installation designed by Ed Ruscha. Ed Ruscha captured the gas station essence in these '10 works from Twentysix Gasoline Stations', photographed in 1962. Ed Ruscha was once asked what architecture a visitor should go to see in Los Angeles. 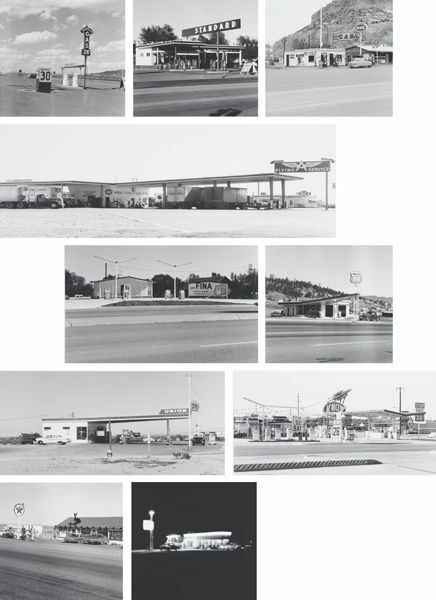 Ed Ruscha replied ‘Gas stations. The fact that they can just put ’em together in about three days'. As the conversation continues, there’s no sense that Ruscha’s telling people to look at gas stations as a provocation, as a deadpan Warholian put-on. He is clearly interested in the look and the depiction, indeed the very idea of gas stations, which is why he paints and photographs them so eagerly. It's also an inevitable consequence of making art out of something as impermanent as a gas station that the depiction outlasts the gas station itself. Phillips de Pury & Company has the sale. Up for auction on May 14th at their NYC location.